Just in case you need to brush up on the basics, or share the joy that is the Michelin Guide with a friend, here is a handy introduction to the Michelin Guide! The Michelin Star Restaurant – What’s it all About? Michelin, a company renowned for automobile tires, may in fact be best known for the Michelin Guide of restaurants around the world. An unexpected pairing for sure! A “Michelin Star” restaurant is the epitome of excellence in fine dining and first launched its guide book in 1900 as a way to promote travel by road throughout France. In 1926, Michelin implemented their 3-star system and applied it to restaurants reviewed by their anonymous inspectors. The Michelin Guide is more than a directory of Michelin Star restaurants and hotels, and their methods have been refined over their 100 year history. Inspectors scrutinize restaurants and hotels throughout the year under a veil of secrecy. The anonymous inspectors, who dine in the local San Francisco area, do so regularly and are trained to meticulously apply the unchanged, time-tested methods first used by Michelin Guide over a century ago! Anonymity is essential to the inspection process, only a select number of restaurants are chosen for the annual Michelin Guide. Each is highly recommended, and earning a Michelin Star Rating is considered as one of the highest honors in the food industry. What Does an Anonymous Michelin Inspector Do? How does the Michelin Star Restaurant get it’s rating? The anonymous Michelin Guide inspectors are expert in their particular geographic area and assurance adherence to the uniform and international Michelin standards of excellence. In order to guarantee complete objectivity, Michelin restaurant inspectors pay in full with each visit, and only evaluate cuisine quality using five criteria as defined by Michelin. What 5 Things Make a Michelin Star Restaurant? 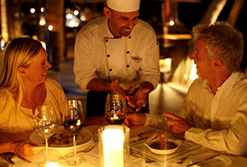 Three Stars – Exceptional Cuisine. Three stars, the highest rating, is given in recognition of exceptional cuisine. It identifies restaurants where diners are met with distinctive dishes, precisely executed with the utmost in fresh, distinguishing ingredients. Michelin Three Star establishments are destinations in and of themselves. Two Stars – Excellent Cuisine. Two stars are given in recognition of excellent cuisine of outstanding quality. Dishes are crafted with obvious skill and care. Michelin Two Star restaurants are worth a trip off the beaten path. One Star – Very Good Cuisine. One star is given in recognition a very good restaurant in its particular category. It acknowledges cuisine prepared to a consistently high standard. Michelin One Star establishments are certainly restaurants worth a stop. What Does the Michelin Guide Have to Do with Real Estate? Quite simply, I am quite passionate about TWO things: Local real estate and local food! Because many of my clients are new to the area, and I am frequently asked for recommendations to fantastic area restaurants, I thought these “foodie posts” would be of interest.I hope you will Enjoy… Bon Appetit!